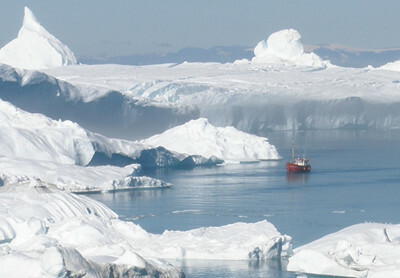 Eqip Sermia (Eqi Glacier) is located 80 km north of Ilulissat, about 3-5 hours sailing by boat. 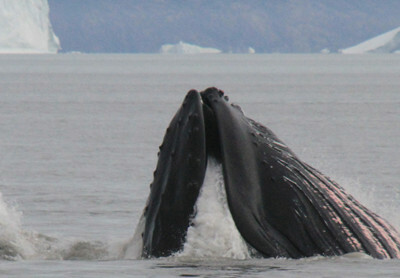 Cruise through beautiful waters, where whales and many forms of ice are often seen. 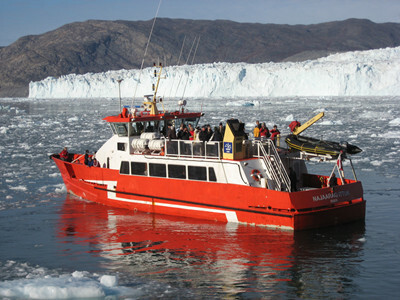 The boat will be positioned at a safe distance in front of the glacier so you can hopefully witness a calving. 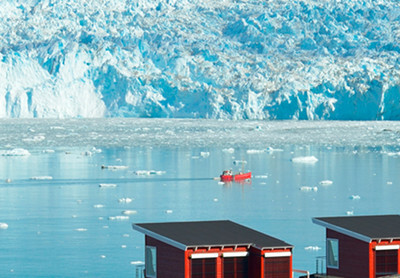 Looking south, you’ll see some red houses facing the glacier. This is the very special camp called Glacier Lodge Eqi. The camp has 15 cabins in varying categories: budget, standard and comfort-cabins. The restaurant ‘Café Victor’ is where all overnight guests enjoy breakfast, lunch and dinner with a view. You’ll also find a shower and toilet here. There is no mobile network or internet. It is peaceful and beautiful and allows you to enjoy nature without the disturbances of modern life. 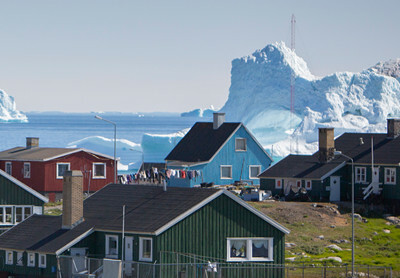 Eqi is often the highlight of a round trip in Disko Bay, with an overnight at Glacier Lodge Eqi included. All excursions to Eqi contain the same great boat trip. Depending on which boat operates that day, the cruise typically takes 3 - 5 hours. To the north you pass in the following order: Bredebugt, the village of Oqaatsut and the fjord Pakitsoq, then to sail through the Ataa Sound with the island of Arveprinsens Ejland behind. On arrival at the Eqi Glacier face, the ship will manoeuvre to a safe and favourable position relative to the calving of ice into the fjord, while you enjoy lunch on board. The ship then drops-off any overnight guests at Glacier Lodge Eqi, before sailing back to Ilulissat. Arrival in Ilulissat between approx. 17:00 hrs (5 pm) and 19:00 hrs (7 pm), depending on which ship is in service this day. Hiking to the delta is a short (about 2 hour) trip, but nevertheless very beautiful and worthwhile. You follow the edge of the water along a route to a small mountain top. From here you’ll have a wide view over the river below. The water is melted water from the ice cap and has the characteristic grey colour because of its salt content. 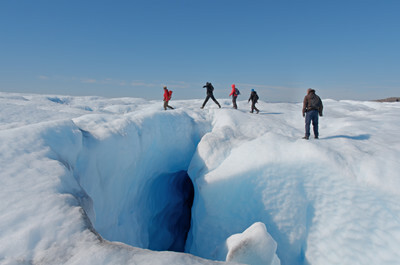 Hiking to the ice cap is an all-day excursion, which typically takes about 8 hours return, incl. a lunch break. Lunch consists of a food package from Cafe Victor. 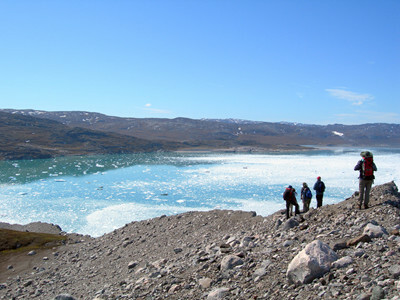 The trip goes through Poul-Emil Victor's historic route and is rewarded with great views of the Eqi Glacier. Base Camp Eqi by the Inland Ice is for those adventurous souls who want to stay in tents close to the ice. This gives the opportunity to spend some time on the ice cap in the company of a professional ice guide. 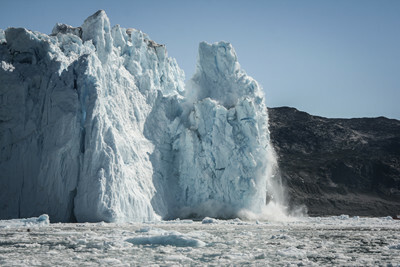 For many Eqi guests, it’s enjoyable enough to simply watch the glacier - watch the ice break off and fall into the water and follow the ripples or waves rolling along the coast. The rumble and crash from the calving, echoes between the mountains. It's deeply fascinating - every time! Here at the lodge's cosy café you can also enjoy the view of Eqi glacier while eating breakfast, lunch and dinner – all Glacier Lodge Eqi overnight guests have full board included in their stay and all meals are taken in the café. The cafe is named after the French polar scientist Paul-Emilie Victor. This location was used as a starting point for his exploration of the Inland Ice, and today his cabin is still a memorial to his many expeditions.